A sympathetic portrait of Jewish history that is, unavoidably, sometimes idiosyncratic in its selection of material to include or omit; it's also purposefully careful to focus more on external than internal Jewish life. Indeed, the Jews come off here as a focal point of world history, so that all of civilization's story can be told simply by following the course of Jewish history and fully considering its background. Johnson attempts to do that with mixed, though generally good, results. His focus is on the Jewish people's central message--ethical monotheism--and how that message has been heard and accepted, ignored, or increasingly attacked by a hostile world. Johnson does have a sense that the Jews have been one unified people hurtling their way through a tormented history; this misleading sense of oneness is why he consistently and incorrectly calls the Jews a race. There are many valuable sections of the book. The Biblical section is forthright in its claims that Biblical persons lived, for example. But the strongest part of the book is about the rise of modern Israel. Although the choice of material is even here sometimes arguable, there is no doubt that Johnson captures the spirit of Zionism and explains it with enviable lucidity, care, and depth of feeling. Nor have the extraordinary incidents of Jewish history been robbed of their drama by pedestrian prose. Johnson rises to each occasion as he needs to invoke a setting or a person. 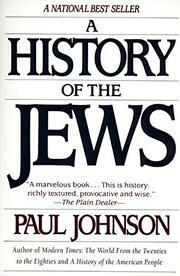 A very readable, useful introduction, then, especially to modern Jewish history.